Pricing pages are powerful points in the conversion journey. One misstep on those pages, however, can result in a world of digital hurt to the bottom line (e.g. no conversions/sales, as well as, potentially, an immediate exit from prospects). With so many psychological triggers affecting purchasing decisions (cognitive biases and what not) development of these pages is no easy task and demands the utmost care. When creating these digital assets and resources, what's most important to remember as it stands today? While there are an infinite number of ways to develop a pricing page (which is part of the problem, obviously), take a quick tour of the business-to-business sector on the Web (in your own vertical or that of another) and you will discover an abundance of examples of the trends and considerations outlined below. I too am a regular visitor of pricing pages, researching articles published online (and in print) at Website Magazine, and have recognized the increased usage of these particular approaches: it's getting personal, it's getting custom and it's increasingly consumer-focused. A company's audience can likely be segmented by the type of user they are - for example a professional user or a personal user. Making available this distinction at the outset of the customer journey ultimately makes it possible for companies to provide pricing tables that are more specific to a particular audience segment. 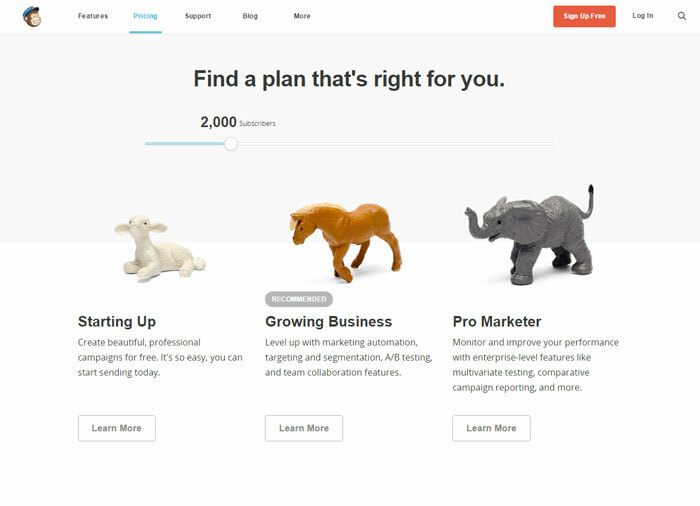 Leverage the "herd" mentality and designate the package most popular among similar users (or most lucrative to your company) within the design of the page. Instead of showing users the most popular pricing plan, reveal your recommendation - guidance about the appropriate path based on their persona (fueled by the source of the visit, their on-site behavior or existing customer profile..
From money-back guarantees and consumer-friendly refund policies to featuring frequently asked questions and live chat support, the more comfortable a user is along their purchasing journey, the more likely they are to convert immediately and in the future. The digital trick, however, is to provide a consumer-focused (self-segmenting and personalized) and creative experience. That's one of the most challenging things to do in digital business but it's not impossible. MailChimp (screenshot below) offers an impressive pricing page which follows along with these trends quite well - and quite creatively. The email service provider lets users self-segment by persona (featuring a descriptive image, title and segment description) but goes a few steps further by including a "Recommended" plan based on the number of subscribers being managed by the brand. What's so creative and unique is that MailChimp lets the visitor use a slide-rule to indicate how many subscribers are on their list (see the live example at MailChimp) and changes the recommendation based on the input. There are plenty of examples of creative pricing pages and readers are encouraged to explore their own market regularly to discover new techniques and tactics. What's the best pricing page you've ever seen or experienced? Share a comment below and let the WM community know!